Economics – CB Capital Research, Inc.
We last discussed the increasing leverage in U.S. corporate balance sheets in our April 1, 2015 commentary (“The Re-leveraging of Corporate America and the U.S. Stock Market“), when we asserted that the combination of historically high U.S. stock market valuations, extremely high participation in the U.S. stock market by hedge fund managers (from a contrarian standpoint), and near-record high corporate leverage makes the U.S. stock market highly vulnerable to a major correction over the next several months. At the time, we noted that U.S. corporate debt issuance averaged $650 billion a year during the 2012-2014 time frame, or 40% higher than the 2009-2011 period. Moreover, U.S. corporate debt issuance was on track to hit a record high in 2015, buoyed by the ongoing surge in M&A activity, sponsor-backed IPOs (companies tend to be highly leveraged upon a private equity sponsor exit), along with record share buybacks and the pressure to increase dividends. At the time, we noted that U.S. corporate debt issuance was on track to hit $1 trillion this year. Since April 1, U.S. corporate debt issuance has continued to increase, although the pace has slowed down since concerns about the Greek debt crisis and the Chinese economic slowdown materialized this summer. Moreover–with energy and metals prices still underperforming–high-yield issuance has slowed down dramatically, although investment-grade issuance has continued to plough ahead. Nonetheless, U.S. corporate issuance has already set a record high this year, with nearly $800 billion of debt issued on a YTD basis (as of last Friday). At the current rate, U.S. corporate debt issuance could still hit $900 billion this year given the still-substantial pipeline of debt issuance driven by the recent frenzy of M&A activity. Moreover, U.S. net cash levels–that of Apple notwithstanding–have been crumbling under ever-increasing dividend yields, corporate buybacks, and M&A activity. Figure 2 below shows the substantial increase of debt/EBITDA ratios in Goldman’s universe coverage–especially since 2011–while companies with positive net cash levels are down by about one-third in the same time frame. Despite the August correction, we believe U.S. stocks remain overvalued. Combined with increasing and near-record high corporate leverage levels, this leaves U.S. stocks in a highly vulnerable position. With the Fed poised to begin a new rate hike cycle at the December 16 FOMC meeting , we believe there is a strong likelihood of a more substantial (15%-20%) correction in the S&P 500 from peak to trough sometime in 2016. In response to a slowing property market, lower consumer spending growth, and a slowing global economy, the People’s Bank of China (PBOC) has cut its one-year policy rate five times and its reserve requirement ratio three times over the last 12 months. Last November, the PBOC’s one-year policy rate sat at 6.00%–today, it is at 4.60%. Moreover, the PBOC’s cut in its reserve requirement ratio–from 20.0% to 18.0% since February–has released more than $400 billion in additional liquidity/lending capacity for the Chinese financial system. Chinese credit growth in August met expectations, but demand for new loans did not. Real borrowing rates for the Chinese manufacturing sector is actually rising due to overcapacity issues and deteriorating balance sheets (China’s factory activity just hit its lowest level since March 2009). No doubt Chinese policymakers will strive to lower lending costs to the embattled manufacturing sector as the latter accounts for about one-third of the country’s GDP and employs 15% of all workers. This will be accompanied by a concerted effort to ease China’s manufacturing/industrial overcapacity issues through more infrastructure investments both domestically and in China’s neighboring countries (encouraged by loans through the Asian Infrastructure Investment Bank, for example). I contend, however, that the PBOC is done with cutting its one-year policy rate for this year, as Chinese policymakers are dealing with a more pressing issue: stabilizing the Chinese currency, the yuan, against the US$ in the midst of recent capital outflows (Goldman Sachs estimates that China’s August capital outflows totaled $178 billion). Simply put–by definition–a country cannot prop up its currency exchange rate while easing monetary policy and maintaining a relatively open capital account at the same time. With the PBOC putting all its resources into defending the yuan while capital outflows continue, it will be self-defeating if the PBOC cuts its policy rate at the same time. The PBOC’s current lack of monetary policy flexibility is the main reason why Chinese policymakers are trying to find ways to stem capital outflows. Rather than easing monetary policy, Chinese policymakers are utilizing other means to directly increase economic growth, such as: 1) Cutting minimum down payment requirements for first-time home buyers from 30% to 25%, 2) Approving new subway projects in Beijing, Tianjin, and Shenzhen worth a total of $73 billion over the next six years, and 3) Cutting sales taxes on automobile purchases from 10% to 5%, effective to the end of 2016. I expect the PBOC to regain its monetary policy flexibility by early next year, as the combination of record-high trade surpluses and still-low external debt should allow China to renew its policy of accumulating FOREX reserves yet again. Technology, along with increasing access to cheap energy, is the lifeblood of a growing, modern economy. As we discussed in our December 2, 2012 article (“The Global Productivity Riddle and the Supercomputing Race“), fully 85% of productivity growth in the 20th century could be attributed to technological progress, as well as increasing accessibility/sharing of cheap energy sources due to innovations in oil and natural gas hydraulic fracturing, ultra-deep water drilling, solar panel productivity, and the commercialization of Generation III+ nuclear power plants and deployment of smart power grids. Perhaps the most cited example where the combined effects of technological and human capital investments have had the most economic impact is the extreme decline in computing and communication costs. Moore’s Law, the ability of computer engineers to double the amount of computing power in any given space every 2 years, has been in effect since the invention of the transistor in the late 1940s. Parallel to this has been the rise of the supercomputing industry. Started by Seymour Cray at Control Data Corporation in the 1960s, the supercomputing industry has played a paramount role in advancing the sciences, most recently in computationally intensive fields such as weather forecasting, oil and gas exploration, human genome sequencing, molecular modeling, and physical simulations with the purpose of designing more aerodynamic aircrafts or better conducting materials. No doubt, breakthroughs in more efficient supercomputing technologies and processes is integral to the ongoing growth in our living standards in the 21st century. Unfortunately, advances in both the U.S. and global supercomputing industry has lagged in the last several years. Every six months, a list of the world’s top 500 most powerful supercomputers is published. The latest list was compiled in June 2015; aside from providing the most up-to-date supercomputing statistics, the semi-annual list also publishes the historical progress of global supercomputing power, each country’s share of global supercomputing power, as well as a reasonable accurate projection of what lies ahead. Figure 1 below is a log chart summarizing the progression of the top 500 list from its inception in 1993. 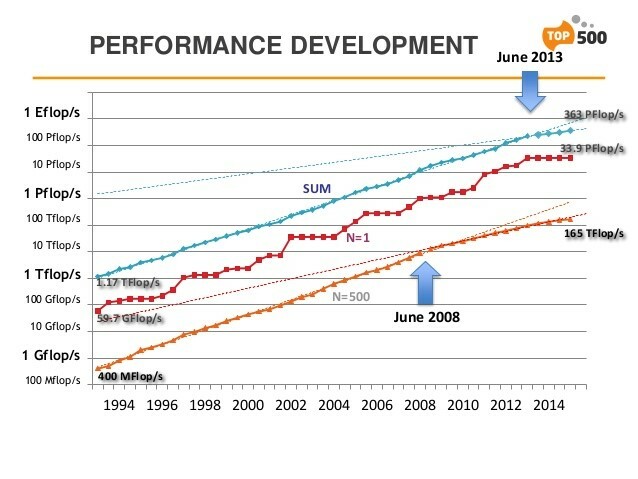 As shown in Figure 1 above, both the sum of the world’s top 500 computing power, as well as the #1 ranked supercomputer, has remained relatively stagnant over the last several years. Just three years ago, there was serious discussion of the commercialization of an “exaflop” supercomputer (i.e. a supercomputer capable of 1 x 10^18 calculations per second) by the 2018-2019 time frame. Today, the world’s top computer scientists are targeting a more distant time frame of 2023. From the U.S. perspective, the slowdown in the advent of the supercomputing industry is even more worrying. Not only has innovation slowed down at the global level, but the U.S. share of global supercomputing power has been declining as well. Three years ago, the U.S. housed 55% of the world’s top 500 supercomputing power; Japan was second, with 12% of the world’s supercomputing power. Rounding out the top five were China (8%), Germany (6%), and France (5%). 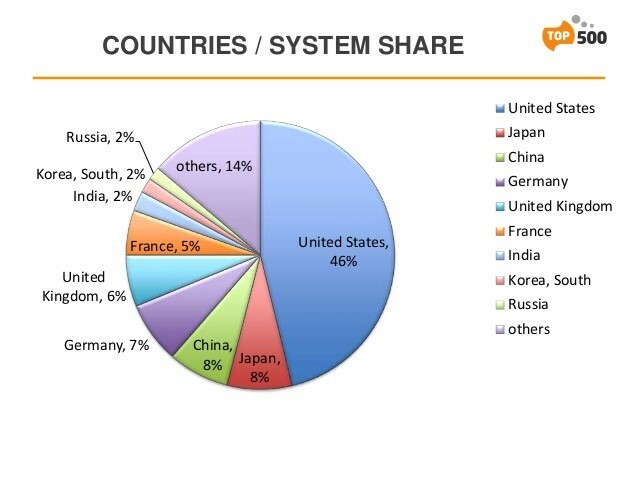 Today, the U.S. houses only 46% of the world’s supercomputing power, with countries such as the UK, India, Korea, and Russia gaining ground. Bottom line: Since the invention of the transistor in the late 1940s and the advent of the supercomputing industry in the 1960s, the U.S. has always led the supercomputing industry in terms of innovation and sheer computing power. With countries such as China and India further industrializing and developing their computer science/engineering expertise (mostly with government funding), U.S. policymakers must encourage and provide more resources to stay ahead of the supercomputing race. To that end, President Obama’s most recent executive order calling for the creation of a National Strategic Computing Initiative–with the goal of building an “exascale” supercomputer–is a step in the right direction. At this point, however, whether the industry can deploy an energy-efficient exascale supercomputer by the less ambitious 2023 time frame is still an open question. Launched by the Narendra Modi-led government last September, the “Make In India” initiative is a long-term, top-down driven policy to transform India into a global manufacturing hub. The 25 economic sectors targeted by the Indian government for export-led development were those determined to possess global trade comparative advantages or significant potential for innovation and job creation. Some of these sectors include: automobiles, aviation, biotechnology, chemicals, defense, electrical machinery, food processing, media & entertainment, pharmaceuticals, railways, renewable energy, and textiles & garments. In my recent weekly newsletters–and in my March 4, 2015 Forbes column (“Modi’s Budget Boosts Bullish Outlook for Indian Stocks“)–I have chronicled and discussed the recent re-acceleration of India’s economic growth due to a combination of government reform efforts and the decline in oil prices, the latter of which provided an immediate 3%-3.5% boost to India’s annual GDP. Since August last year, I have asserted that India’s economic growth rate would surpass that of China; this year, I expect India’s GDP to grow at about 8%–higher than China’s expected GDP growth rate which I expect to come in at 7% or below. Recent economic data–such as April’s industrial production year-over-year growth of 4.1% (surpassing consensus by more than 200 bps) and May’s benign CPI reading of 5.0%–suggests that my Indian economic outlook is on track. With the Reserve Bank of India’s policy repo rate still at 7.25%, there remains significant room for the Indian central bank to ease monetary policy in order to maintain the country’s high growth rates, as long as the CPI reading stays below 6.0%. I maintain that India’s long-term growth trajectory remains intact; I expect the size of India’s economy to double by the end of 2020–to $4 trillion or more–and for the earnings of the MSCI India equity index to more than double in the same time frame. In the past, I have discussed several reform policies and trends that would act as secular tailwinds for the India economy, including: 1) a concerted crackdown of cronyism and corruption and raising foreign direct investment caps from 26% to 49% in the insurance and defense industries–both of which would heavily encourage more FDI inflows into India, 2) a renewed focus on infrastructure investments–including a nationwide 4G network–as well as much-needed land reforms to encourage further industrialization, 3) rising confidence in the leadership of the Reserve Bank of India as Governor Rajan asserted the central bank’s independence with an inflation-targeting framework that was recently codified into law, and 4) India’s uniquely young and educated workforce. I consider the “Make in India” initiative to be a major policy focus that is essential to India’s long-term economic development. Unlike China’s “growth at all costs” policy from 1978 to 2008–i.e. a 19th century style command-and-control network of various centralized systems of production–while taking advantage of low-cost labor and lax environmental regulations, India is encouraging the production of higher value-added goods through a more decentralized approach of empowering decision-makers at the corporate level. At the same time, India’s labor laws have historically offered a high degree of protection for workers. To a major extent, India’s historical rejection of the 19th century style of command-and-control capitalism has limited the country’s industrialization and consequently, its export sector of manufactured goods. Of course, over the last 25 years, India’s exports have increased both as a share of GDP and world exports–but this was mostly driven by increases in the exports of services and primary products & resources (i.e. rice, cotton, diamonds, iron ore, etc. )–as opposed to the exports of medium- and high-tech manufactured goods. Since 1991, total Indian exports as a share of Indian GDP rose from around 8% to almost 25% in 2013; while Indian exports as a share of world exports tripled from around 0.5% to 1.7% during the same time frame. Of note, however, is the rapid increase in Indian service exports in just the recent decade. From 2000-2013, Indian services exports as a share of world services exports have tripled to over 3.0%. 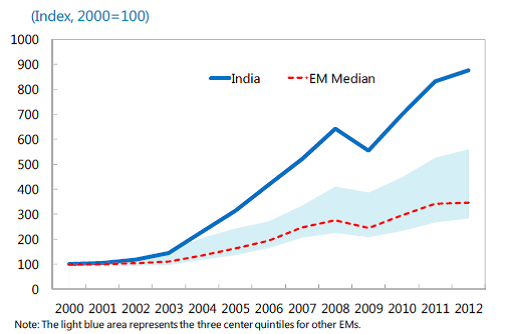 Growth in Indian services exports has been rapid; indeed, it has surpassed that of other EM countries by a wide margin (see Figure 2 below). Indian services now make up 35% of all of the country’s exports, which is even higher than the average in advanced economies. The vast majority of fast-growing EM economies over the last several decades relied on industrialization and subsequent growth of manufacturing exports (both absolute and relative to total exports) to jump-start their economies. 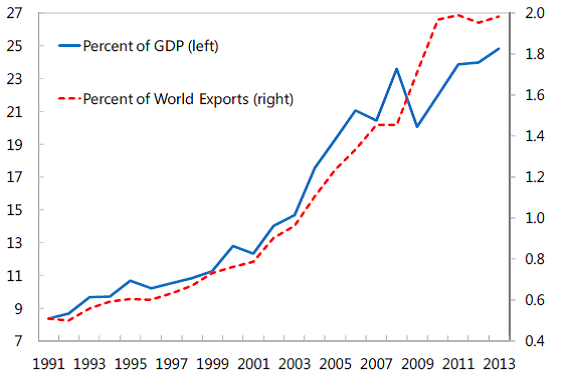 In 2013, for example, China’s manufacturing exports accounted for 90% of total exports, double the share during 1980-85. The share of Indian manufacturing exports as a share of total exports, however, has actually declined over the last 15 years, due to India’s over-reliance on growth driven by the services and primary goods & resources industries. 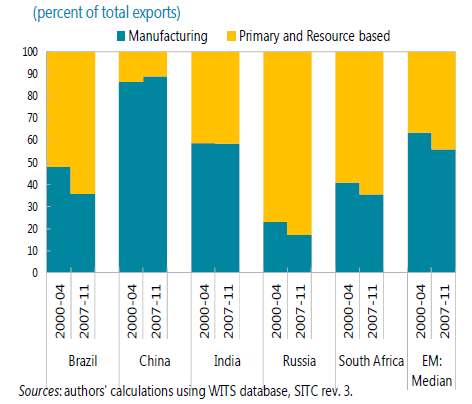 Within the goods sector, the share of manufacturing has declined over the last decade as well (see Figure 3 below). To jump-start the “Make In India” initiative to turn India into a global manufacturing hub, I believe the following three key policies need to be adopted–either at the public- or private-sector level. Trade reforms to expand trade in the long-run: Historically, the Indian government has utilized trade policy as a tool to address short-term objectives such as limiting inflation or minimizing the volatility in commodity prices. Such incoherent policies included export taxes, minimum export prices, and ad hoc adjustments to import duties. The World Trade Organization noted that in its last review, minimum export prices for onions, sugar, and potato were changed in order to control the domestic supply of vegetables. Such policies increase uncertainty for both exporters and importers – major trade reforms are thus needed to provide a long-term boost to Indian manufacturing exports. In our March 12, 2015 commentary (“The Weakening of the CB Capital Global Diffusion Index Suggests Lower Asset Prices“), we discussed the shortcomings of Goldman Sachs’ Global Leading Indicator (GLI) based on its over-reliance on various components such as the Baltic Dry Index and commodity prices & currencies (specifically, the AU$ and the CA$). To Goldman’s credit, the firm has been highly transparent and vocal over the last several months about the distortions created by an oversupply of dry bulk shipping capacity and an impending wall of additional supply of industrial metals, such as copper and iron ore.
Goldman Sachs thus recognized that the GLI’s downturn in December last year (by that time, the bear market in oil and metals prices were well under way) was providing misleading cyclical signals of the global economy, with the exception of certain economies such as Australia, Canada, Brazil, and Russia. Indeed, our own studies suggest that global economic growth was still on par to hit 3.5% in 2015–with U.S. economic growth hitting 3.0%–while energy-importing countries such as India would actually experience an acceleration to 7%-8% GDP growth. That being said, Goldman’s GLI remains highly instructive. Since December, other components of the GLI have begun to exhibit weakness that is consistent with a contraction of the global economy. Components exhibiting significant weakness include global industrial survey data (PMI), as well as new orders to inventory data (NOIN). Countries exhibiting significant weakness include the U.S., China, Norway, Japan, Turkey, and surprisingly, India. Meanwhile, Germany, France, and Italy are experiencing industrial production growth–likely due to the declining euro and record-low borrowing rates. In a nutshell, our latest studies are now finally confirming Goldman’s GLI readings (a high probability of a global economic contraction). In our March 12 commentary, we asserted that global asset prices (especially equity prices) are poised to experience a +10% correction, given the weakness in the readings of the CB Capital Global Diffusion Index (the CBGDI). The CBGDI is constructed differently in that we aggregate and equal-weight the OECD leading indicators for 30 major countries, including non-OECD (but globally significant) members such as China, Brazil, Turkey, India, Indonesia, and Russia. The OECD’s Composite Leading Indicators possess a better statistical track record as a leading indicator of global asset prices and economic growth. Instead of relying on the prices of commodities or commodity currencies, the OECD meticulously constructs a Composite Leading Indicator for each country that it monitors by quantifying country-specific components including: 1) housing permits issued, 2) orders & inventory turnover, 3) stock prices, 4) interest rates & interest rate spreads, 5) changes in manufacturing employment, 6) consumer confidence, 7) monetary aggregates, 8) retail sales, 9) industrial & manufacturing production, and 10) passenger car registrations, among others. Each of the OECD’s country-specific leading indicator is fully customized depending on the particular factors driving a country’s economic growth. With the 2nd derivative of the CBGDI declining further from last month’s reading, we believe the global economy is very vulnerable to a major slowdown, especially given the threat of a Fed rate hike later this year. We believe two or more Fed rate hikes this year will be counter-productive, as it will reduce U.S. dollar/global liquidity even as many Emerging Markets economies are struggling with lower commodity prices and declining foreign exchange reserves. We also remain cautious on global asset prices; we will mostly sit on the sidelines (or selectively hedge our long positions with short positions on the market) until one of the following occurs: 1) global liquidity increases, 2) the 2nd derivative of the CBGDI begins to turn up again, or 3) global risk asset or equity prices decline by +10% from current levels. We will look to selectively purchase energy-based (i.e. oil, natural gas and even coal) assets given the historical divergence of the CBGDI and WTI crude oil/natural gas prices. We continue to believe that U.S. shale oil production is topping out as we speak. Should the WTI crude oil spot price retest or penetrate its recent low of $44-$45 a barrel (or if the U.S. Henry Hub spot price declines below $2.50/MMBtu), there will be significant opportunities on the long side in oil-, gas-, and even coal-based assets. The U.S. stock market as of the end of 1Q 2015 is overvalued, overbought, and overleveraged. As we discussed in our weekly newsletters over the last couple of months, the S&P 500 is trading at its highest NTM (next 12 months) P/E and P/B ratios since early 2001, just prior to the bursting of the bubble in U.S. technology stocks. Note that today’s record P/E ratios are being accompanied by the highest corporate profit margins in modern history, which in turn are supported by ultra-low borrowing rates and a highly accommodative environment for corporate borrowing. On the demand side for stocks, we also know that global hedge fund managers are now holding the largest amount of long positions in U.S. stocks (56% net long as of year-end 2014) since records have been kept. With the global hedge fund industry now managing $2 trillion in assets, we believe it is a mature industry–as such, we believe the positions of hedge fund managers could be utilized as a contrarian indicator. In addition, note that no major U.S. indices (e.g. Dow Industrials or the S&P 500) have experienced a 10%+ correction since Fall 2011. Coupled these with the immense leverage on U.S. corporate balance sheets–as well as the U.S. stock market–this means that U.S. stocks are now highly vulnerable to a major correction over the next several months. According to Goldman Sachs, U.S. corporate debt issuance averaged $650 billion a year during the 2012-2014 time frame, or 40% higher than the 2009-2011 period. U.S. corporate debt issuance is on track to hit a record high this year, supported by the ongoing rise in M&A activity, sponsor-backed IPOs (companies tend to be highly leveraged upon a PE exit), and share buybacks and increasing dividends. In fact–at the current pace–U.S. 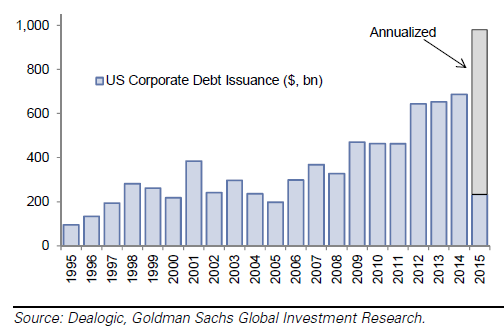 corporate debt issuance will hit $1 trillion this year (see figure 1 below). Over the last 12 months, member companies in the Russell 1000 spent more on share buybacks and paying dividends than they collectively generated in free cash flow. Across Goldman’s coverage, corporate debt is up 80% since 2007, while leverage (net debt / EBITDA)–excluding the period during the financial crisis–is near a decade-high. We believe the combination of high valuations, extreme investors’ complacency, and near-record high corporate leverage leaves U.S. stocks in a highly vulnerable position. The situation is especially pressing considering: 1) the high likelihood for the Fed to raise rates by 25 basis points by the September 16-17 FOMC meeting, and 2) the increase in financial market volatility over the last six months. Finally, investors should note that U.S. margin debt outstanding just hit a record high as of the end of February. 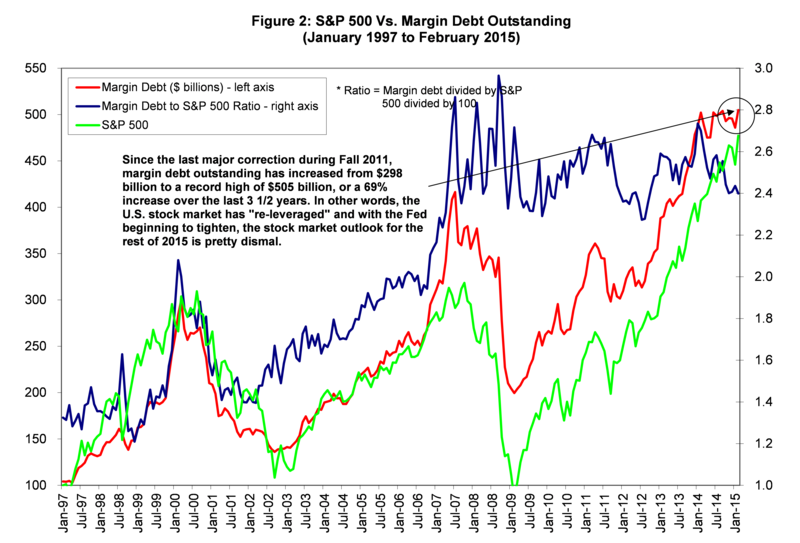 Our studies and real-time experience indicate significant correlation between U.S. margin debt outstanding and other leverage indicators (including ones that may not be obvious, such as the amount of leverage utilized by hedge funds through the OTC derivatives market), as well as major peaks and troughs in the U.S. stock market. Since the last major correction in Fall 2011, U.S. margin debt outstanding has increased by 69%–from $298 billion to $505 billion–to a record high. In other words, both corporate America and the U.S. stock market have “re-leveraged.” With the Fed no longer in easing mode–coupled with extreme investors’ complacency and increasing financial market volatility–we believe U.S. stocks could easily correct by 10%+ over the next several months. The Economist just published an article discussing the Baltic Dry Index (“BDI”) and its lack of usefulness as a global leading economic indicator. We know Goldman Sachs constructs its global leading economic indicator with the Baltic Dry Index as one of its components. To its credit, Goldman discloses this and quantifies the impact of the BDI (along with each of its other components) on a monthly basis. Over the last decade, the BDI has become increasingly volatile–first, due to the rapid industrialization of China; then the subsequent over-building of ships just as the 2008-2009 global financial crisis led to a drop in global trade. Today, the BDI sits at an all-time low; it is down by 65% in the last 13 weeks alone. This is the major reason why we do not include the BDI as one of our leading indicators on the global economy; it is very difficult to strip out the BDI’s volatility due to fluctuations in shipping utilization, as well as idiosyncratic events such as port or iron ore mine disruptions. We prefer to utilize leading indicators that are less dependent on fluctuations in shipping utilization or commodity supply. This is why we like the OECD Composite Leading Indicators, which we incorporate into our CB Capital Global Diffusion Index (“CBGDI”). The OECD’s Composite Leading Indicators, unlike those compiled by others, are much less dependent on commodity prices or exchanges rates of commodity currencies, i.e. the Australian dollar, the Brazilian real, the Canadian dollar, and the New Zealand dollar. Instead, the OECD meticulously constructs a Composite Leading Indicator for each country that it monitors by quantifying country-specific components including: 1) housing permits issued, 2) orders & inventory turnover, 3) stock prices, 4) interest rates & interest rate spreads, 5) changes in manufacturing employment, 6) consumer confidence, 7) monetary aggregates, 8) retail sales, 9) industrial & manufacturing production, and 10) passenger car registrations, among others. Each country-specific leading indicator is fully customized depending on the particular factors driving the country’s growth. To recap, the CBGDI is constructed by aggregating and equal-weighting (on a 3-month moving average basis) the OECD leading indicators for 30 major countries, including non-OECD members such as China, Brazil, Turkey, India, Indonesia, and Russia. The CBGDI has historically led or tracked the MSCI All-Country World Index and WTI crude oil prices since the fall of the Berlin Wall in November 1989. Historically, the rate of change (i.e. 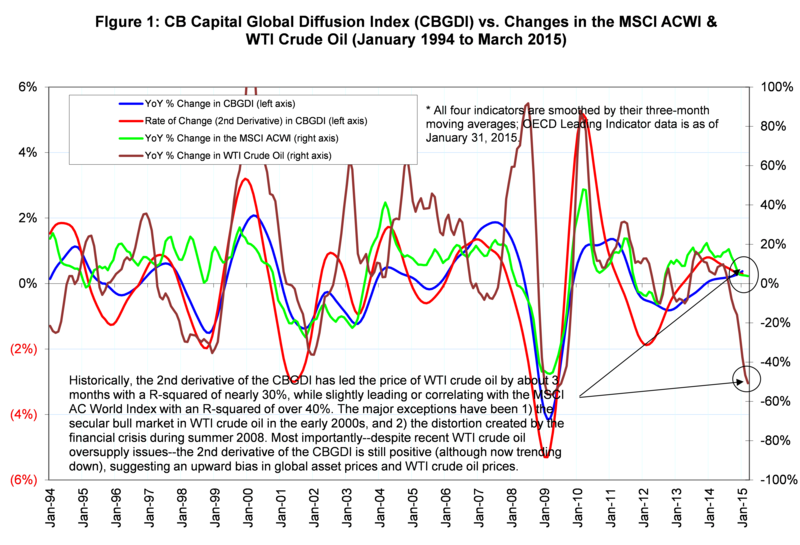 the 2nd derivative) of the CBGDI has led WTI crude oil prices by three months with an R-squared of 30%, while tracking or leading the MSCI All-Country World Index sightly, with an R-squared of over 40% (naturally as stock prices is typically one component of the OECD leading indicators). 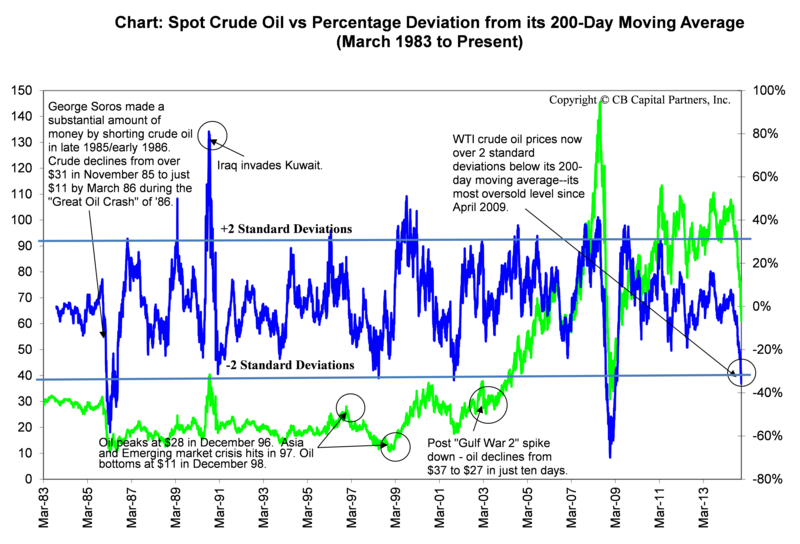 We first introduced our CB Capital Global Diffusion Index (“CBGDI”) in our March 17, 2013 commentary (“The Message of the CB Capital Global Diffusion Index: A Bottom in WTI Crude Oil Prices“), when WTI crude oil traded at $93 a barrel. Based on the strength in the CBGDI at the time, we asserted that WTI crude oil prices have bottomed, and that WTI crude oil is a “buy” on any further price weakness. Over the next six months, the WTI crude oil spot price would rise to over $106 a barrel. We last discussed the action of our CBGDI in our November 19, 2014 commentary (“The CB Capital Global Diffusion Index Says Higher Oil Prices in 2015“). 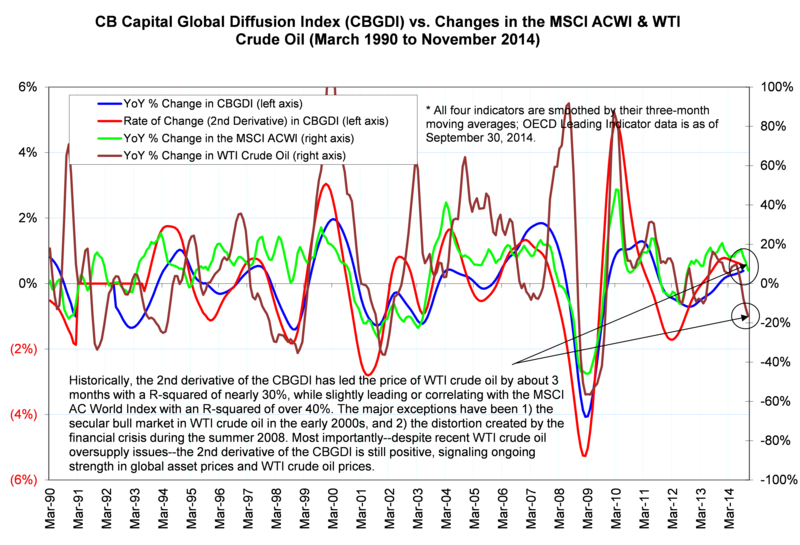 At the time, we mentioned that–due to the strength in the CBGDI–WTI crude oil prices will likely rise in 2015. We obviously were early on that call as: 1) OPEC subsequently refused to cut production leading to the “Valentine’s Day Massacre” in global oil prices, and 2) the supply of U.S. shale oil continued to rise despite lower prices (a trend that is now ending). Despite the recent weakness of the CBGDI, however, the historic divergence between the CBGDI and WTI crude oil prices suggest that the latter is bottoming. The case for higher crude oil prices is compounded by the fact that U.S. shale oil production growth is now stagnating (which we discussed in our recent weekly newsletters, and just confirmed by the Energy Information Administration). Should the WTI crude oil spot price retest or penetrate its recent low of $44-$45 a barrel, there will be significant opportunities on the long side of the commodity. With the CBGDI expected to weaken further this year, we also do not believe the Fed should hike rates anytime soon (even a one-time 25 basis point hike)–especially given the recent strength in the U.S. dollar. A Fed rate hike will be counter-productive as it will simply reduce U.S. dollar/global liquidity at a time of global risk-aversion and reduced economic activity. We thus remain cautious; we will mostly sit on the sidelines until one of the following occurs: 1) global liquidity increases, 2) the CBGDI begins to turn up again, or 3) global asset prices correct by more than 10% from current levels. Over the last six months, WTI crude oil prices declined from a peak of $107 to $60 a barrel, or a decline of 44%. Many analysts, including the Energy Information Administration (EIA), are forecasting even lower prices, and more glaringly, for prices to stay at these levels for at least the next 12-24 months. The EIA is forecasting WTI crude oil to average $63 a barrel in 2015 (down from its October forecast of $95 a barrel), while Andy Xie, a Chinese economist, is forecasting oil prices to stay at $60 over the next five years. The oil market is now in a state of panic. We believe WTI crude oil prices will recover to the $75 to $85 range by the second half of 2015 as: 1) fear in the oil markets subsides, 2) shale production growth plateaus or even declines, and 3) global demand increases as a reaction to lower oil prices. Let’s examine these three reasons in more detail. At $60 a barrel, WTI is now more than two standard deviations below its 200-day moving average, its most oversold level since March 30, 2009. With the exception of the 6-month declines during: 1) late 1985/early 1986, and 2) summer 2008 to December 2008, the WTI crude oil price is now at a level which has previously marked a multi-year bottom. More importantly–from a technical standpoint–oil prices have always bounced faster than most analysts expected. E.g. After hitting $10.73 a barrel in December 1998, WTI rose by 80% to $19.28 a barrel over the next 6 months; similarly, after hitting $17.48 a barrel in November 2001, WTI rose by 68% to $29.38 over the next six months. Note that in the latter case, the rise in oil prices occurred despite the 9/11 attacks and the fact that the U.S. economy was in recession. Just like today, analysts were expecting oil prices to remain low during December 1998 and November 2001. In its December 2001 forecast, the EIA expected WTI to average $21.79 a barrel in 2002. WTI would average $26.17 in 2002, or 20% higher. We believe the current supply/demand dynamics today are even more conducive for a quick snap-back and a subsequent stabilization at higher crude oil prices. Our recent MarketWatch.com article discusses three reasons why the U.S. shale supply response in reaction to lower oil prices will be faster than expected. Those are: i) shale drilling is inherently capital intensive; many shale E&P firms have relied on GAAP and dubious accounting practices to mask the high, ongoing costs to sustain shale production, ii) unlike the major, multi-year projects undertaken by major, integrated oil companies, shale production growth is highly responsive to prices, and iii) shale depletion rates are much faster than those of conventional oil production. These arguments for faster-than-expected shale production declines are stronger than ever. Firstly, shale drillers have only sustained the boom as long as there was ample financing, but this game is now about to end. The spread for high-yield energy debt has already jumped from less than 450 basis points in September to 942 basis points today. We expect financing to dry up for marginal drillers and fields; higher financing costs will also increase the costs of shale oil production, creating an overall higher hurdle for shale projects. Secondly, shale fields on average take about 6-9 months to come online, which is much faster than for most conventional projects. With such a quick response time, we expect shale production growth to slow down dramatically by April-May of 2015. Thirdly, higher efficiencies have meant faster depletion rates. Shale producers are looking for quick paybacks, and so are highly incentivized to begin and ramp up production as quickly as possible. As discussed by the EIA, the monthly decline in legacy shale oil production is about 300,000 barrels a day. We expect U.S. shale oil production to begin declining by April-May of 2015 unless prices rise back to the $75-$85 a barrel range. Our recent MarketWatch.com article discusses why U.S. gasoline consumption is already surprising on the upside, with the AAA estimating that Thanksgiving travel by car was up by 4.3% from last year, and the highest in the number of miles driven in seven years (versus EIA’s estimate of a 20,000 barrel decline in U.S. gasoline consumption in 2015). Higher demand is also now materializing in other parts of the world. For example, the Society of Indian Automobile Manufacturers reported a higher-than-expected 10% year-over-year rise in domestic passenger vehicle sales due to lower fuel prices. We expect Indian automobile growth to pick up even more next year as the Reserve Bank India (India’s central bank) will likely cut policy rates by early next year. This will reduce the cost of auto loan financing, thus increasing automobile affordability for the Indian middle class. In addition, Chinese car sales in November still increased by 4.7% year-over-year despite an economic slowdown and a broad government mandate to limit car ownership in major cities. We believe both Chinese and Indian oil demand growth will be resilient as both the country’s central banks have ample room to slash interest rates, thus countering any pressures of a further global economic slowdown. Now, more than ever, we reiterate our bullish stance on oil prices. We expect WTI crude oil prices to bounce back soon and to stabilize and mostly trade in the $75-$85 range by the second half of 2015. To recap, we have constructed a “Global Diffusion Index” by aggregating and equal-weighting (on a 3-month moving average basis) the leading indicators data for 30 major countries in the Organisation for Economic Co-operation and Development (OECD), along with China, Brazil, Turkey, India, Indonesia, and Russia. Termed the CBGDI, this indicator has historically led or tracked the MSCI All-Country World Index and WTI crude oil prices since the fall of the Berlin Wall. Historically, the rate of change (i.e. the 2nd derivative) of the CBGDI has led WTI crude oil prices by about three months with an R-squared of 30%, while tracking or leading the MSCI All-Country World Index slightly, with an R-squared of over 40% (naturally, as stock prices actually make up one component of the OECD leading indicators). Our logic rests on the fact that the vast majority of global economic growth in the 20th century was only possible because of an exponential increase in energy consumption and sources of supply. Since 1980, real global GDP has increased by approximately 180%; with global energy consumption almost doubling from 300 quadrillion Btu to 550 quadrillion Btu today. That is–for all the talk about energy efficiencies–the majority of our economic growth was predicated on the discovery and harnessing of new sources of energy (e.g. oil & gas shale fracking). Until we commercialize alternative, and cheaper sources of energy, global economic growth is still dependent on the consumption of fossil fuels, with crude oil being our main transportation fuel. As such, it is reasonable to conclude that–despite the ongoing increase in U.S. oil production–a rising global economy will lead to higher crude oil prices. As noted, the rate of change (2nd derivative) in the CBGDI (red line) has historically led the YoY% change in WTI crude oil prices by about three months. The major exceptions have been: 1) the relentless rise in WTI crude oil prices earlier last decade (as supply issues and Chinese demand came to the forefront), and 2) the explosion of WTI crude oil prices during the summer of 2008, as commodity index funds became very popular and as balance sheet/funding constraints prevented many producers from hedging their production. An imminent, 1-trillion euro, quantitative easing policy by the ECB: The ECB has no choice. With the euro still arguably overvalued (especially against the US$ and the Japanese yen), many countries in the Euro Zone remain uncompetitive, including France. On a more immediate basis, inflation in the Euro Zone has continued to undershoot the ECB’s target. A quantitative easing policy by the ECB that involves purchasing sovereign and corporate bonds will lower funding costs for 330 million Europeans and generate more end-user demand ranging from heaving machinery to consumer goods. While such a policy will strengthen the value of the U.S. dollar, we believe the resultant increase in oil demand will drive up oil prices on a net basis. The growth in shale oil drilling by the independent producers are inherently unpredictable. Over the last several years, the U.S. EIA has consistently underestimated the growth in oil production from fracking. With WTI crude oil prices having declined by nearly 30% over the last four months, we would be surprised if there is no significant cutback in shale oil drilling next year. Again, the EIA has consistently underestimated production growth on the upside, so we would not be surprised if the agency overestimates production growth (or lack thereof) on the downside as well. Consensus suggests that OPEC will refrain from cutting production at the November 27 meeting in Vienna. With U.S. shale oil drilling activity still near record highs (the current oil rig count at 1,578 is only 31 rigs away from the all-time high set last month), any meaningful production cut (500,000 barrels/day or higher) by OPEC will only encourage more U.S. shale oil drilling activity. More importantly, Saudi Arabia has tried this before in the early 1980s (when it cut its production from 10 million barrels/day in 1980 to just 2.5 million barrels/day in 1985 in order to prop up prices), ultimately failing when other OPEC members did not follow suit, while encouraging the growth in North Sea oil production. Moreover, OPEC countries such as Venezuela and Iran cannot cut any production as their budgets are based on oil prices at $120 and $140 a barrel, respectively. As a result, it is highly unlikely that OPEC will implement any meaningful policy change at the November 27 meeting. With U.S. shale oil drilling activity still near record highs, we believe WTI crude oil prices are still biased towards the downside in the short run. But we believe the recent decline in WTI crude oil prices is overblown. Beginning next year, we expect U.S. shale oil drilling activity to slow down as capex budgets are cut and financing for drilling budgets becomes less readily available. Combined with the strength in our latest CBGDI readings, as well as imminent easing by the ECB, we believe WTI crude oil prices will recover in 2015, averaging around $80 a barrel. India is experiencing a resurgence as one of the world’s largest economies. According to the late Cambridge professor Angus Maddison, India’s share of the world’s income peaked at over 20% in 1700, about equal to all of Europe’s share at the time. By 1952, however, India’s share of the world’s income has shrunk to just 3.8%, despite its status as the world’s second most populous country. Many economic liberalization policies were implemented beginning in 1991 (most reforms were forced upon India in exchange for an IMF bailout in 1991)–beginning a period of economic growth acceleration. From 2003-2007, Indian real GDP growth averaged 9% a year–hitting double digits immediately after the 2007-2009 global financial crisis. Despite years of high growth, as well as a highly educated and young workforce, the Indian economy slowed down dramatically beginning in 2012, registering just 4.4% growth that year. Today, the size of India’s economy (in nominal terms) is only US$1.9 trillion, equivalent to 2.7% of world GDP. Since then, Indian economic growth has regained ground. The IMF recently raised its 2015 GDP growth estimate from 6.0% to 6.4%. We expect Indian real GDP growth to hit 7% in the next several years–surpassing that of China–and for the size of the Indian economy to surpass US$5 trillion (in nominal terms) by the end of 2020. As we mentioned in two of our recent articles on MarketWatch (“Why Indian stocks are a buy right now” and “Top three Indian stocks to buy (and hold)“), much of this growth will be driven by business-friendly reforms implemented by the Modi government. These reforms include: 1) removing barriers to greater foreign investments, especially in the defense and insurance sectors, 2) a national policy to provide 150 million Indians a bank account by 2018, 3) a national plan to spend $1 trillion on infrastructure investments, 4) a more independent central banking policy with a new monetary policy framework of inflation targeting, and 5) a concerted crackdown on cronyism among the highest levels of government. The recent 30% decline in global crude oil prices (India imports 70% of its energy needs)–as well as the just-announced deregulation in diesel prices–will also provide a significant tailwind to the Indian economy. We expect Brent crude to mostly trade within the US$75-US$95 a barrel range for the next several years, thus assisting India’s growth plans. We believe U.S.-India cross-border financing activities and investment opportunities will grow significantly as the Indian economy generates unprecedented amounts of entrepreneurial talent and wealth over the next decade. CB Capital Partners is already engaged in U.S.-India cross-border corporate finance transactions. We will be in Mumbai, Hyderabad, Pune, and Ahmedabad to meet clients and research investment opportunities for two weeks during January 4-18, 2015. We believe there are many industries poised for substantial growth and thus represent attractive, long-term investment opportunities. Following are highlights of some industries that we like–and where our clients are actively doing business in. Digital Media: Nearly 300 million Indians go online to listen to music, watch a film, a TV show, or cricket match through their cell phones, computers, or tablets. Today, Indian digital media garner over $4 billion in digital pay revenues annually, with digital advertisement revenues at nearly $400 million. Both are expected to grow at double digits for the foreseeable future. In February 2012, Disney paid almost $500 million for the remaining stake of UTV that it did not already own—a huge bet on the emerging Indian middle class. Within this industry, CB Capital Partners is heavily involved in providing financing in the Indian animation industry. The Indian animation industry has an 8.2% market share in Asia-Pacific, and is expected to grow by over 20% annually to $2.9 billion by 2015.
eCommerce: India is experiencing the most rapid growth of online buyers in history. Amazon recently announced that its Indian online business is on track to become the fastest country ever to reach $1 billion in sales. On July 29, Flipkart, a homegrown eCommerce company based in Bangalore, announced that it raised $1 billion from Tiger Global Management, Accel Partners, Morgan Stanley Investment Management, and Singapore’s GIC. Forrester estimates the number of Indian eCommerce customers will reach 39 million by the end of this year, and an astonishing 128 million by the end of 2018. By the end of 2020, the Indian middle class population (the target market for apparel, consumer electronics, and personal care products) will rise to over 300 million, or the equivalent to the size of the U.S. population. Amazon already announced on July 30 to invest an additional $2 billion into its Indian business. Healthcare: CB Capital Partners has substantial financing and investment experience across the healthcare industry (30% of all our transactions have been in the healthcare industry), including pharmaceuticals, generics, biotechnology, stem cells, medical devices, medical IT, and hospitals. Another sub-industry we are tracking is the medical tourism industry in India. There will be many opportunities to invest in hospitals or hospital-related services (such as medical hotels) that specialize in this trend as the global population ages. It is estimated the Indian medical tourism industry is now worth $2 billion, with over 150,000 patients traveling to India each year for medical procedures. Finance: The Modi government’s initiative to provide 150 million Indians a bank account by 2018 is significant, as only 60% of India’s population have access to financial services today. Financial services are essential to a modern, growing society. While many Indians had traditionally put their savings in physical assets such as gold, this option will no longer be attractive as inflation trends down (the Indian CPI declined to an all-time low of 6.4% in September). Banks in particular will also benefit from the government’s recent increase in the housing loan interest tax deduction from 150,000 to 200,000 rupees (or $2,450 to $3,300) a year as this policy will increase demand for residential mortgage loans. CB Capital Partners is ready to assist both our U.S. and Indian clients who want to learn more or are already engaged in U.S.-Indian cross-border financing or fund-raising activities. Our strategy in India covers a full suite of traditional investment banking services such as equity & debt raises, M&A services, and fairness opinions.